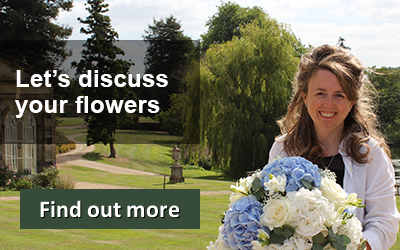 I had a wonderful time working on Hayley and Bill’s spring wedding flowers. 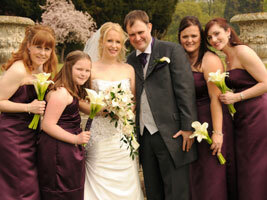 The couple chose an elegant wedding flower theme based around lilies and orchids. 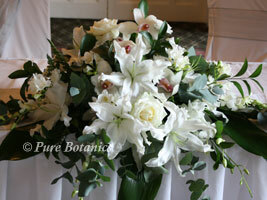 These two flowers worked really well together to produce some stunning wedding flowers. 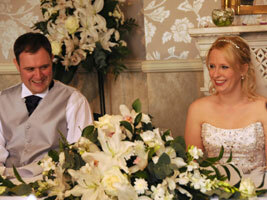 In the photos you can see Hayley’s shower bouquet that features white calla lilies and cymbidium orchids. I packed the bouquet full of both the flowers using the calla lilies right down into the trailing point with delicate soft ruscus leaves and strands of beargrass. 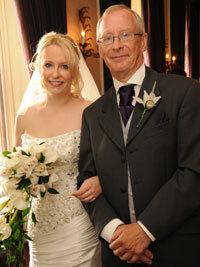 In the photo on the right you can see that Hayley’s dad wore a coordinating cymbidium orchid buttonhole. 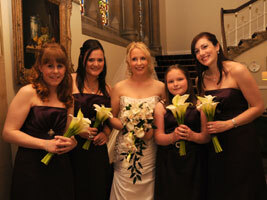 The bridesmaids all had handtied posy bouquets of white calla lilies to coordinate with the bride’s bouquet. 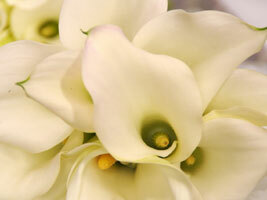 I love the simplicity of these bouquets; the calla lily is such a beautiful flower that it works really well on its own. I finished the stems of the bouquets off with deep purple satin ribbon to match the bridesmaid’s dresses. 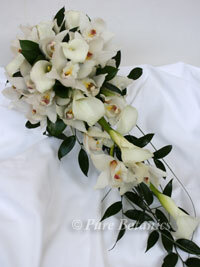 Above you can see the groom Bill wearing a white calla lily buttonhole. 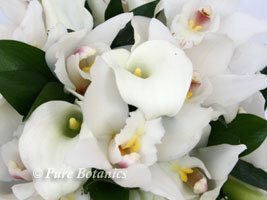 The small white calla lilies look really smart. We often suggest that the groom has a slightly different buttonhole to the rest of the gents so that his stands out and is a little bit more special. This buttonhole has been a really popular design. 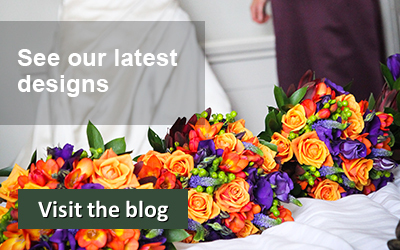 From the first time Hayley and Bill saw our lily wedding centrepiece design it was obvious that they had fallen in love with it. That’s not surprising as it fitted so well with their elegant and sophisticated wedding look. These table centrepieces really do have the wow factor and are simply stunning. 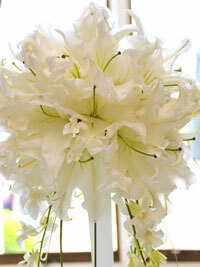 They are created using the beautiful white oriental lily. 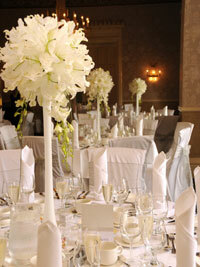 They were placed in our tall slim white lily vases with trailing white Singapore orchids and beargrass. All the spring wedding flowers were brought together in the top table arrangement that you can see in the photo’s here, as well as the pedestal stands. The photo on the left shows the arrangement on the registrar’s table for the wedding ceremony, it was then moved to the top table for the wedding breakfast. I always recommend moving the flowers and using them as much as possible. They are so beautiful that you want to use them as many times as you can. You can also see in the photo right how the pedestal stands have been moved to either side of the top table after the ceremony. It was a glorious spring day for Hayley and Bill that meant they could make the most of the beautiful grounds at Walton Hall for their wedding photos.